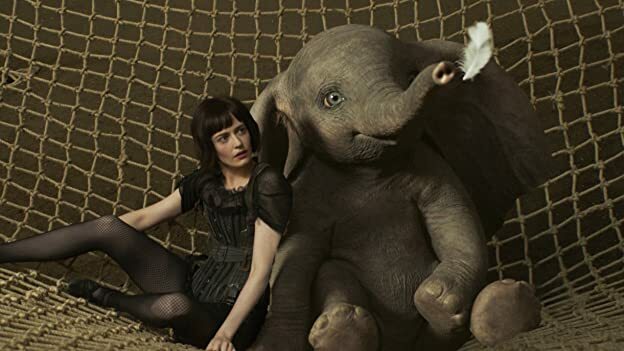 Neils Skellig: [from trailer; seeing Dumbo dressed as a clown] He doesn't look like magic to me. Burton's live action Disney take on an emotionally driven circus act is profoundly dull. Probably, this has always been the risk that Tim Burton's (the director) sketchy cartoonish world comes with. Even looking at his previous projects, you can easily say that each of the visual galores could have gone wrong. But it is that fine analysation of emotion that Burton personifies on a screen with one dimensional characters; that makes it, against all odds, much better. So when you hear about the collaboration of Burton and Disney, you would think that it is a match made in heaven. Unfortunately, you are going to lose that bet, for carrying out such a wallop of drama, he has decided to surf above it, in fact hover around it, but will not and does not get his hand dirty. There is no string attached to the storytelling, no thread to link them all, ironically in a concept where everyone is rooting for one innocent character. You feel physically distant with this world, not when it tries to brag about its cookiness but when expresses the humane qualities. Although, for a brief period, it does get your feet taping in rhythm, but the credit goes to the "teamwork" theme that Disney has been endorsing since ages. The performance is decent coming from Danny DeVito as a goofy manager and Nico Parker as a sweet host of the storyline. And on the other hand, major contenders like Colin Farrell as an over brooding post war hero, Eva Green as the dame and Michael Keaton as a stereotypical evil billionaire fails to make our heart pump fast. Dumbo is not the example to put on a table full of love letters to Disney films, what humanized the animated version in the early 40s, is alienated vigorously by shattering our childhood memories. 40 of 59 people found this review helpful. Was this review helpful to you?